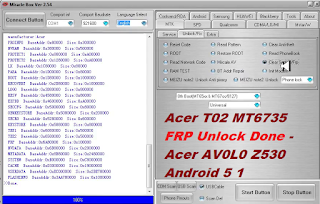 Acer T02 MT6735 FRP Unlock Done - Acer AV0L0 Z530 Android 5 1 FRP unlock done with Miracle Box. 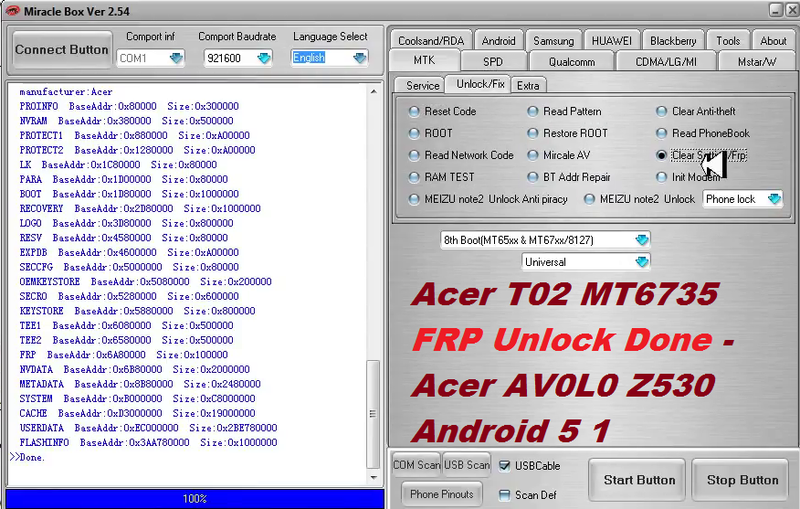 To know how to FRP unlock Acer Android phone having MTK CPU please follow the below steps. In this tutorial you know how to remove Factory Reset Protection (FRP) lock for the Acer T02 MediaTek Android phone. As you know before Hard reset and FRP unlock please backup all your necessary data on the phone, otherwise you may lose all the user data in the phone. 6. Select Clear Settings/FRP and Click on Start Button. 10. Wait until the unlock process completed. Download free MTK frp tool 100% working here Miracle Box, which working without box just download it and enjoy free flashing and unlocking tool for any Android smart phone, all in one frp unlock tool free download, mediatek frp unlock tool 2018, latest frp unlock tool for mediatek, spd and qualcomm cpu, lastest mediatek frp unlock tool freeware download here, Android fastboot frp unlock tool, miracle box free frp unlock tool latest.